Cook, shaking pan occasionally, until popcorn stops popping. Immediately pour into serving bowl. Pick a flavor to add personality to your popcorn. Stir together 2 tablespoons granulated sugar, 3/4 teaspoon ground cinnamon, 1/4 teaspoon salt and 1/8 teaspoon ground ginger. Drizzle 2 tablespoons melted butter over warm popcorn; toss to coat. Sprinkle with spice mixture, and toss until evenly coated. Stir in 1 cup milk chocolate chips. Stir together 1 teaspoon ancho chile powder, 1/2 teaspoon salt, 1/4 teaspoon dried oregano leaves and 1/4 teaspoon chipotle chile powder. Drizzle 2 tablespoons melted butter over warm popcorn; toss to coat. Sprinkle with spice mixture, and toss until evenly coated. Stir in 1 cup coarsely chopped beef jerky. Stir together 1 teaspoon brown sugar, 1 teaspoon garam masala, 1/2 teaspoon curry powder and 1/2 teaspoon salt. Drizzle 2 tablespoons melted butter over warm popcorn; toss to coat. Sprinkle with brown sugar mixture, and toss until evenly coated. Stir in 2 cups salted cashew halves and 1/2 cup toasted coconut. Stir together 1 teaspoon granulated sugar, 1 teaspoon five-spice powder, 1/2 teaspoon salt and a dash cayenne pepper. Drizzle 2 tablespoons melted butter over warm popcorn; toss to coat. Sprinkle with sugar mixture, and toss until evenly coated. Stir in 2 cups sesame sticks. Ya just can't click through the TV channels without landing on a talent show these days -- from dancing stars to singing hopefuls, wannabes of every flavor take center stage to give it a shot. We love watching the rising stars, but it’s the judges and their ginormous personalities that keep us comin' back each week for more. Did you bum out when you heard Simon Cowell left American Idol? Do you miss watching the bubbly chemistry he had with Paula Abdul? Prepare to celebrate: They're both back and feistier than ever as judges on The X Factor, America's version of the popular British singing competition show. 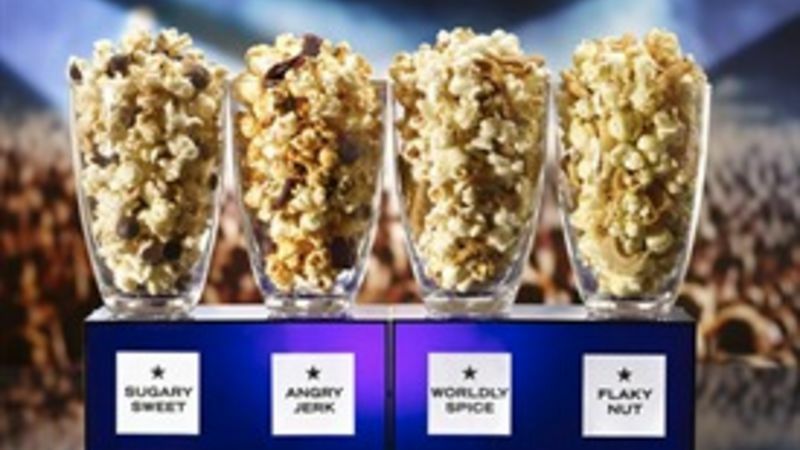 To celebrate their reunion (and talent show judges everywhere), the Betty Crocker™ Taste Seekers created You Be The Judge Popcorn Mix -- delish homemade popcorn pumped up with flavors inspired by the sweet and spicy personalities of the judges we love or hate. Pick a fave! Sugary Sweet, Angry Jerk, Worldly Spice or Flaky Nut ... You be the judge! Make up a big batch or two, and sit down to watch the season premieres.